Those beige looking pieces aren’t chicken, I promise! I didn’t pick up on it at the time but they look like chicken from the photo, don’t you reckon? Sorry my meat eater friends, today’s post is all about celebrating the natural flavours of vegetables and mushrooms. 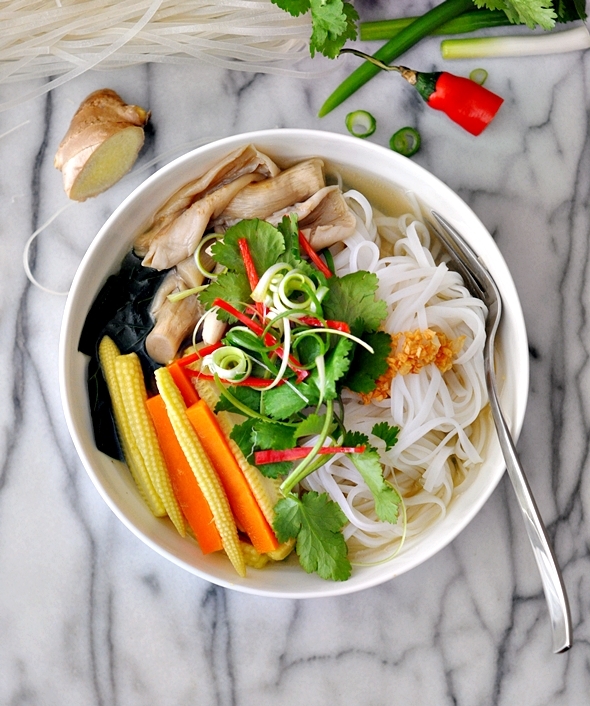 This mushroom and vegetables noodle soup recipe came about when I was feeling a little under the weather. Unfortunately, I caught a cold. With a heavy head and a blocked nose, I wanted to make a dish that I can throw together quite easily and quickly. To me, cooking vegetarian food was a good start. 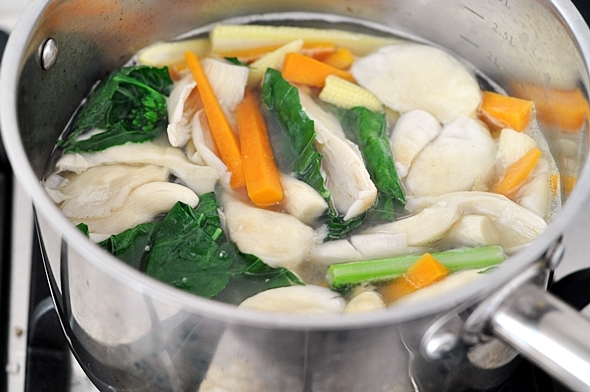 Whenever I feel sluggish, all I want to do is to stay cosy with my blanket and a bowl of steaming hot noodle soup. And do you know that inhaling steam helps to ease a blocked nose? In a 5 litres stock pot, add cooking oil and garlic. Heat over low heat and fry the garlic until golden brown. 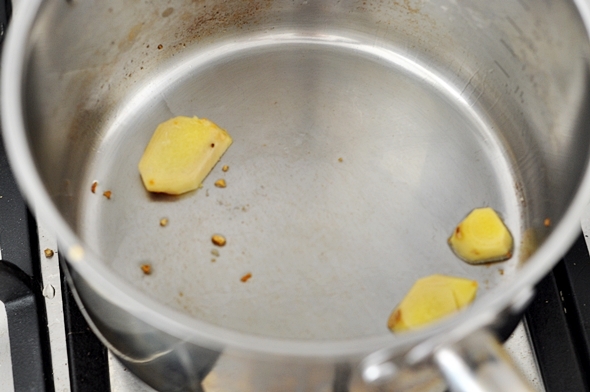 Transfer the crispy garlic and oil (leave about a teaspoon of oil in the pot) to a heat proof bowl and set aside. In the same stock pot, add ginger. Saute the ginger in the garlic infused oil until aromatic over low heat. 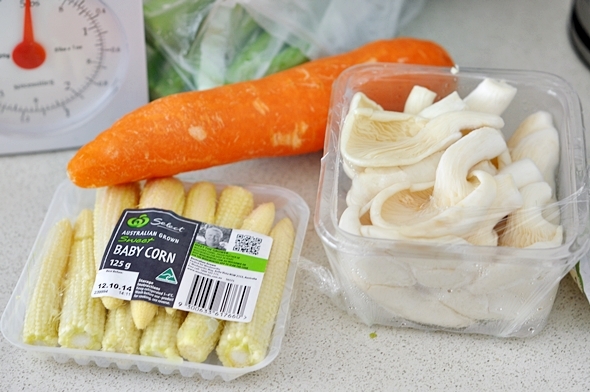 Add carrot, oyster mushrooms and baby corns. Saute for a few seconds and pour in the stock. Cover the pot with a lid and wait until the stock is boiling. 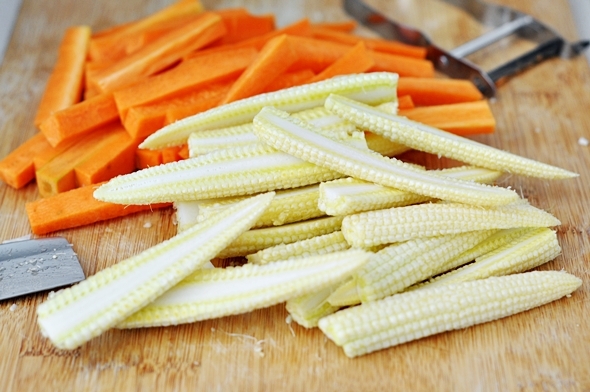 Add gai larn to the stock and continue to cook until all the vegetables have become tender. 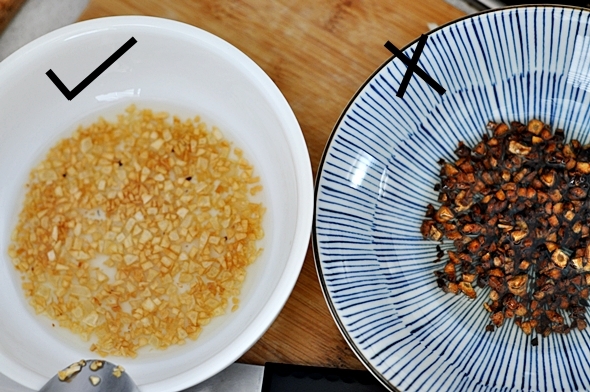 Add half of the crispy garlic, white pepper, sesame oil and season with soy sauce to taste. Set aside. 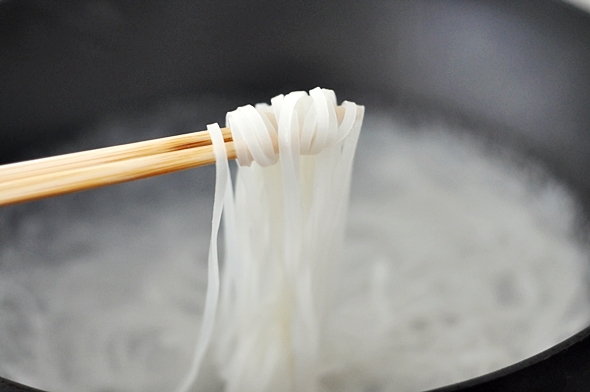 Cook rice stick noodles according to packet instructions. Divide the noodles into 2 -3 bowls. Ladle the soup and vegetables into the respective bowls. Garnish with the remaining crispy garlic, coriander, spring onion and/or chilli. Serve immediately and enjoy! So my dear friends, what’s your feel-good remedy whenever you feel under the weather? Do you have approximate American measurements available?